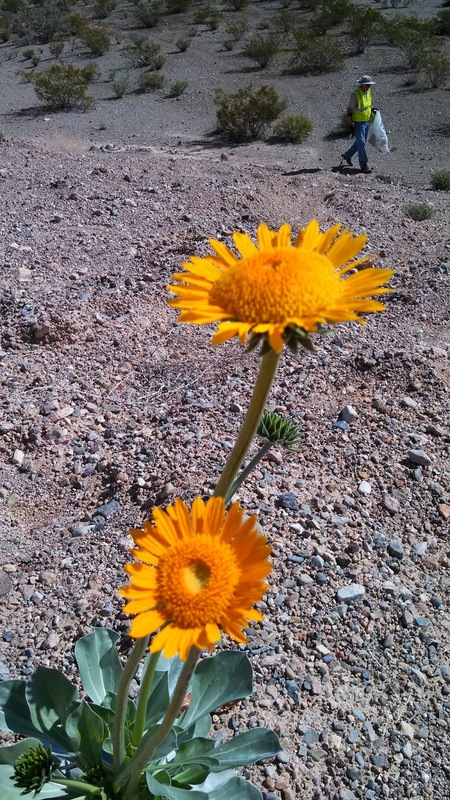 Our first two weeks here in Nathrop and Chalk Creek CG have been really cool. Joan and I have had a good time so far. Unfortunately you won't see any photos for a couple of weeks from now. For about a month we've been noticing that our PC was very slow to respond when we attempted to access our photos. After running some diagnostics and calling Dell tech support it was determined that we have a problem with the hard drive. I've backed up all our data, including our pics and the PC is being sent back to Dell for repairs. We should have the PC back in 7-10 days. Aaahhhhh....don't you just love technology. Back to Nathrop.......we've had snow 3 mornings since we've been here, including one morning when the overnight temps got down to 5 (yes, single digit) degrees. Even with snow in the mornings, almost all of it is gone by the end of the day. It's been sunny and comfortable during the day with high temps anywhere from the low 50's to 70. 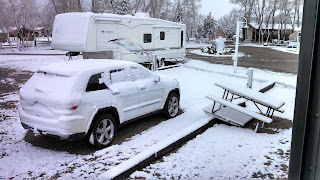 Last week we were enjoying the view with snow on the car and surrounding mountains; had the heaters going inside the RV all snug and warm when we started to hear water dripping. We quickly noticed water starting to leak out from under the refrigerator. We turned off the water to the RV and started to investigate. What we found was not as bad as we thought.....the ice maker water filter (located behind the fridge in the outside access panel) had frozen and split. No problem until later in the day when the ice began to thaw. When that happened the water began to squirt out and run down the rear of the fridge. We were able to replace the filter and dry out the gallon or so of water that had leaked inside. We've started to explore the area in the jeep and taken a couple of roads up into the mountains until we reach the snow line. Those roads lead to the high passes and we'll have to wait until late June or July before we can explore those fully (including a couple of ghost towns....yippeeee!). And we've seen herds of elk and deer. Joan has her bird feeders out and she's already started to see hummingbirds. And Iv'e been cleaning up some odds and ends maintenance items....replace toilet bowl seals and the drip guard on the shower door....new water filters outside and inside. Still on the list is installation of a Trik-L-Charge for the chassis batteries and trouble shooting the rear view camera. Wish me luck. Last week we drove into Denver (about 2 1/2 hours away) to see the Rockies - Braves baseball game. We had great seats with 50 degree temps and plenty of sunshine. The Braves took a lead into the 9th but the Rockies tied the game 5-5 in the bottom of the inning. FREE BASEBALL! And in the bottom of the 12th the Rockies scored to win 6-5. I've contacted the recreation departments in both Buena Vista and Salida (the towns on either side of Nathrop) and gotten my name in a pool for playing softball. There's a pick up game this afternoon and I'm hoping to meet some of the team managers and find a team to play on this summer. Wish me luck. We've begun helping Lars and Tamara here at Chalk Creek. We've gone out a couple of days with Lars and picked up 3 truck loads of firewood. Also the office and general store were remodeled from 2 separate rooms into one large room during the off-season. We've been helping to set up and stock shelves. Joan has begun training in the office and I've been working with Lars in the CG. We are 1 of 4 workamper couples this season and the 1st to move into the CG. A 2nd couple Jack & Joyce moved from nearby Buena Vista into the CG yesterday. The other 2 couples should be here within the next 2 weeks. On a side note. 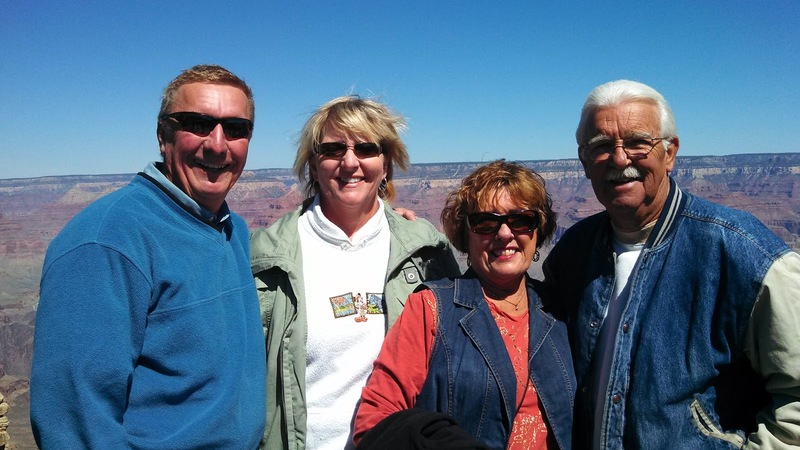 Please keep our fellow RVers and friends Rudee and Phil in your thoughts. 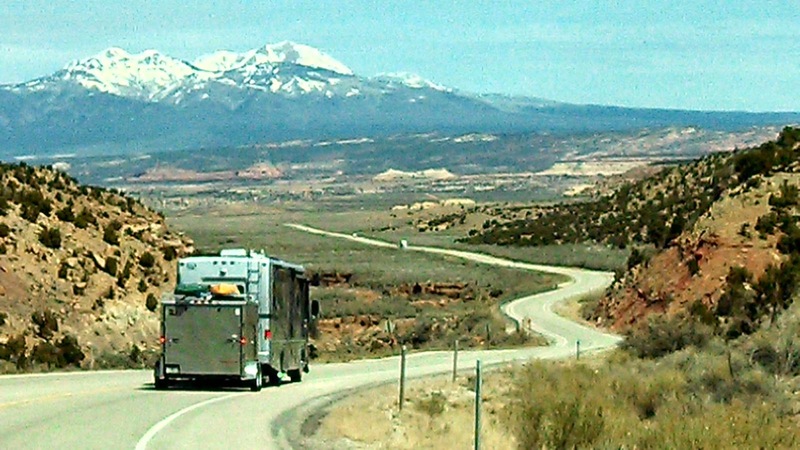 As anxious as we are to spend a few days in Colorado before we report to Chalk Creek, the weather forecast along our route is not the most conducive for a life long Florida driver to tackle with a 40' 16 ton motorhome towing a trailer. Therefore we decided to spend a few more days in Moab. And we had a blast doing so! 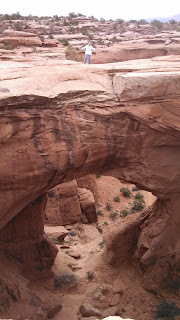 John and Pam invited us to hike Tower Arch in Arches NP with them. 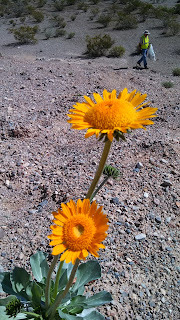 We met them at the park entrance and drove several miles into the park before taking a gravel road to the trailhead. The hike included some ups and downs with a total 3.4 miles round trip. And the trip was well worth it. The arch is called Tower Arch because it looks as though there is a tower on top of it. That however is an optical illusion. The tower is actually a 'fin' rock formation immediately behind the arch. John and I explored the tower by climbing a few rocks. Standing at the base of the tower we were afforded a beautiful view of the surrounding area. The next day we decided to go off road again and check out Long Valley. 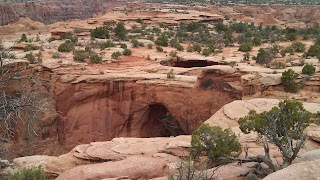 Somewhere near the end of Tower Arch hike I twisted my ankle, so Joan and I thought this would be a good chance for her to 'earn her wings' and drive her 1st off road trail. Long Valley was one of 2 trails recommended to us when we first arrived. And the recommendation was spot on. The trail pulls off Potash Road and parallels the Potash Road/Shafer Basin trail we took earlier in the week (see the previous blog entry) eventually coming out on the entrance road to Dead Horse SP. 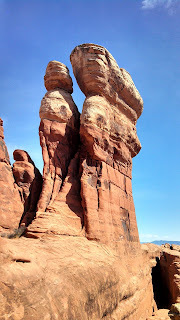 The views of needle and fin rock formations, Arches NP and the LaSal Mountains were fantastic. No real obstacles except for a huge rock that had fallen from a cliff face and came to rest leaning on the cliff face. 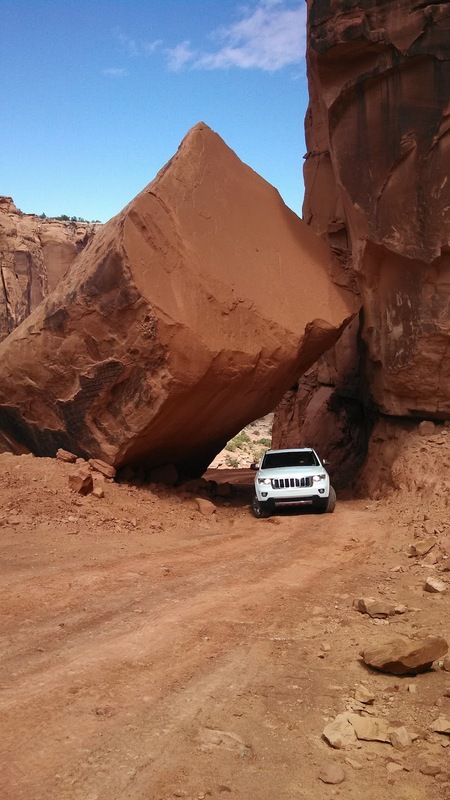 The trail forces vehicles to drive under the rock. 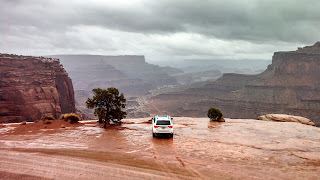 When we finished Long Valley we continued on to explore Canyonlands NP. Two great rivers converge here, the Colorado and Green Rivers merge among over 500 square miles of canyons, mesas, buttes, fins, arches and spires. On the way out of Canyonlands Joan was feeling confident and decided she would like to drive the switchbacks we had driven a couple days earlier in Shafer Basin. This time the road was dry and I enjoyed being able to relax and view the scenery as Joan drove down. We turned around at the bottom and headed back up. Everything was going well until we started to slide towards the cliff face. Joan was paying attention to the drop off and got a little too close to the waist-deep ditch along the cliff face. Too late....we slid until the car grounded on the frame. No serious damage, but with the chassis on the ground and both right side tires spinning freely off the ground we weren't going anywhere soon even with 4-wheel drive. Fortunately we carry a small folding shovel and I started to work building a ramp out of nearby large rocks and the dirt I dug out from under the car. 2 large blisters and 45 minutes later we were free and on our way home...with Joan driving. Joan did great and intends to continue practicing her off road driving. 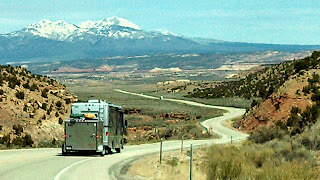 The weather forecast for Friday and Saturday was for sunshine and dry roads so we headed towards Colorado. 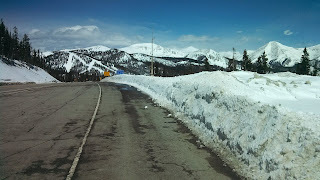 We stayed overnight in Montrose and then left early Saturday for Nathrop via Gunnison and 11,300' Monarch Pass. The weather forecast was accurate and other than the 'pucker factor' that most motorhome drivers experience the first time they encounter high mountain passes the drive was fine. We arrived in Nathrop at Chalk Creek CG Saturday afternoon and set up in our home for the summer. We drove into nearby Buena Vista to explore and decided to stop at a local pub for dinner. 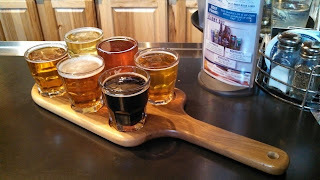 Joan has really enjoyed sampling the local beers while we were in Oregon and Nevada. The pub EddyLine brews several different beers and offered a beer paddle to allow sampling. Joan really liked 5 of the 6 she sampled. We returned home and went to bed with another winter storm forecast for overnight. We awoke Sunday morning with 1" of snow covering everything. Our 1st ever snowfall (other than a small snow flurry while driving through Cuba, NM last year) since we've been full-timing. Cool! We've been doing a little more exploring of the area and I've been doing some odds and ends around the MH the last few days. 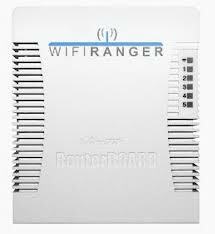 Our internet access has been spotty at several of our stops so I ordered and installed the WiFiRanger Go. The install was easy and I had all 4 of our WiFi devices up and running with a 4 of 4 bar signal strength private wireless LAN within 30 minutes. We're hoping the weather clears up so that we can take a drive to Denver and take in a Rockies game next week. Other than that we're just enjoying experiencing the mountain weather and exploring the area. 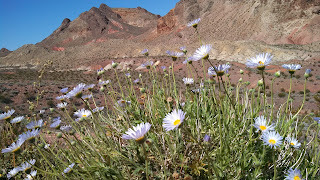 We left Lake Mead on the 2nd headed towards Williams, AZ where we had a reservation at Grand Canyon Railway RV Park (Passport America and a real nice CG). We parked next to our friends Larry and Jean. 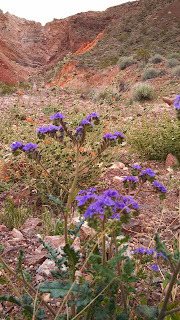 Wednesday moring we all headed up to Grand Canyon NP. I'm sure you've seen pictures, probably taken by professionals so there's not any I could add other than to introduce you to Larry and Jean. The 4 of us spent all day Friday checking out Mesa Verde. 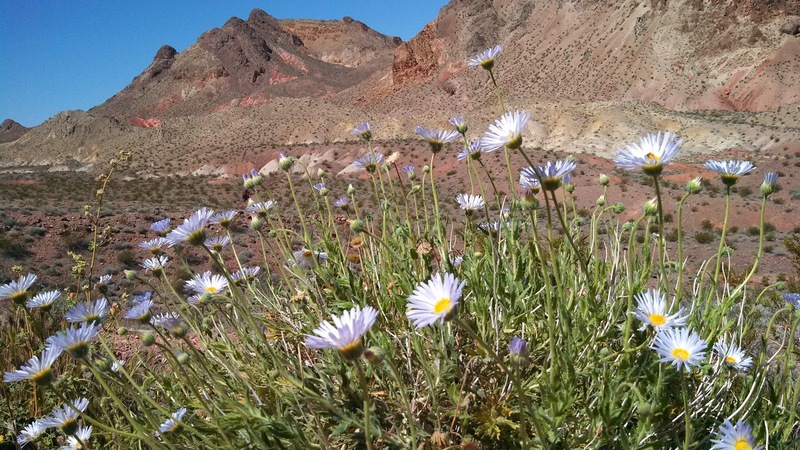 We were still too early in the season to take advantage of some of the ranger led tours of the cliff dwellings, so we're really thinking we may stop back in September as we drive from Nathrop back to Lake Mead. We did however hike the 1/4 mile path down to Spruce House. Spruce House is not the largest of the cliff dwellings but it is the most preserved. We stopped at several of the pull offs in the park to see pit houses, pueblos and other cliff dwellings. 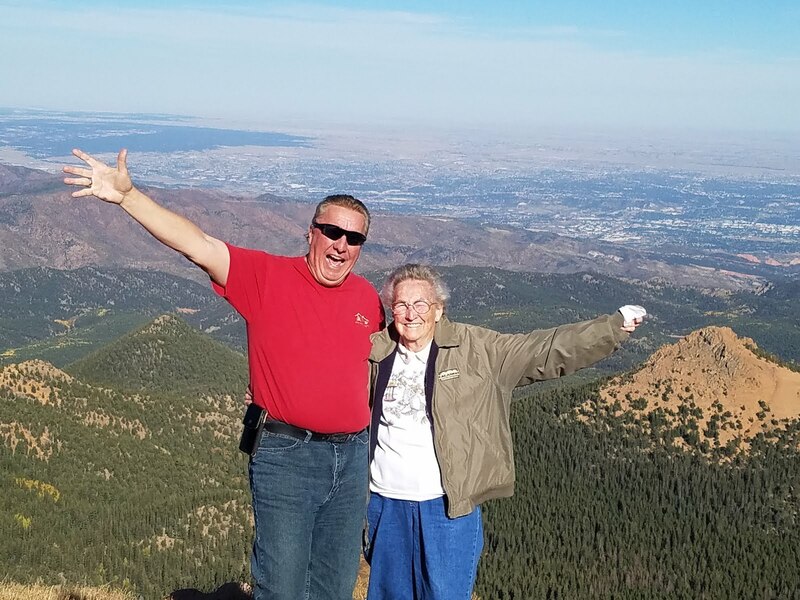 Saturday found us headed to Moab and Larry and Jean headed towards Colorado Springs where they will be working at Garden of the Gods CG. We checked out several of the campgrounds in Moab and found one that that had space for our rig. 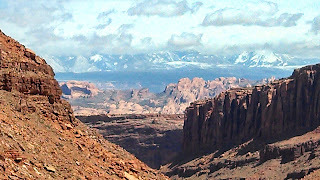 The week before Easter is Jeep Jamboree in Moab and the week after is spring break in many surrounding areas. As such many of the CG's did not have space until 2 weeks after Easter. We got set up and immediately headed out for a jeep ride. Someone had suggested we try the Gemini Trail. 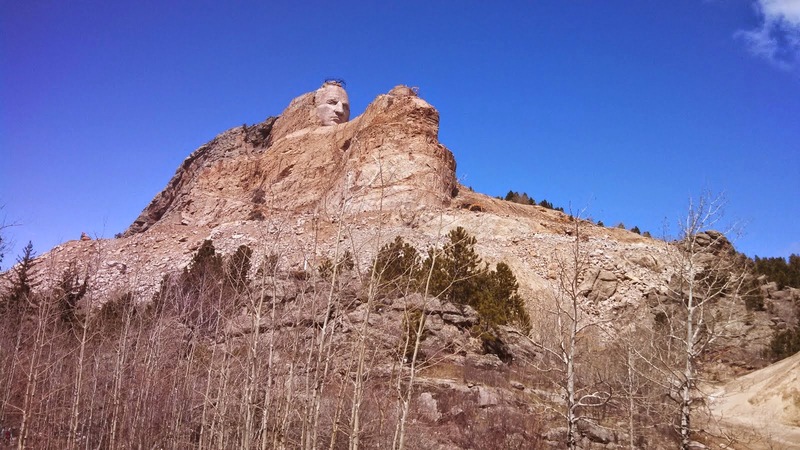 The trail is just north of town and climbs the face of the mountain along the side of Hwy 191. 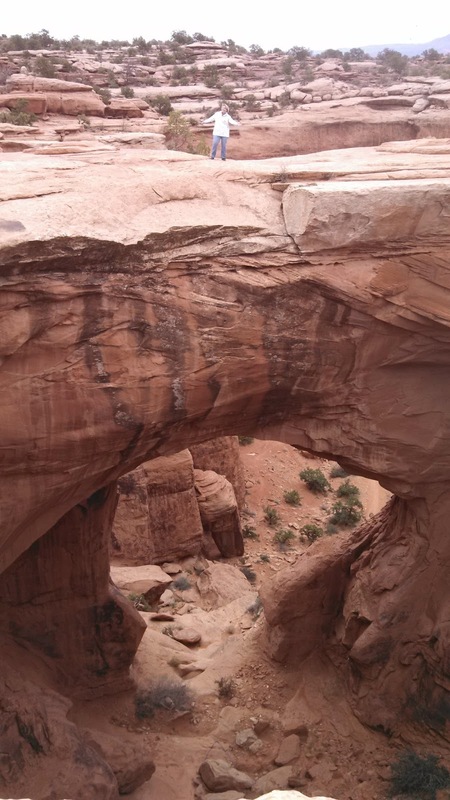 About 8 miles into the trail we came to a pull off and parked to walk down and see the twin arches. I thought these to be unusual as they don't stand above ground level; rather they were formed by a large washout on the edge of a mesa. The top of these arches are level with the edge of the mesa rim. Sunday we drove out to Dead Horse Point State Park taking a few short excursions along the way whenever we saw an interesting looking dirt trail. Once we arrived we visited the Visitor Center before taking a short hike along the canyon rim. We found a good place to stop and have lunch. After lunch Joan was feeling adventurous so she went out on a ledge......6' wide and 1000' above the valley floor. 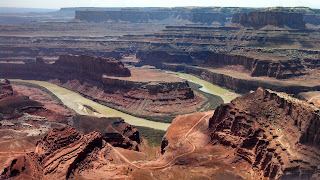 It offered a great overlook on the Colorado River. Then we drove out to Dead Horse Point. 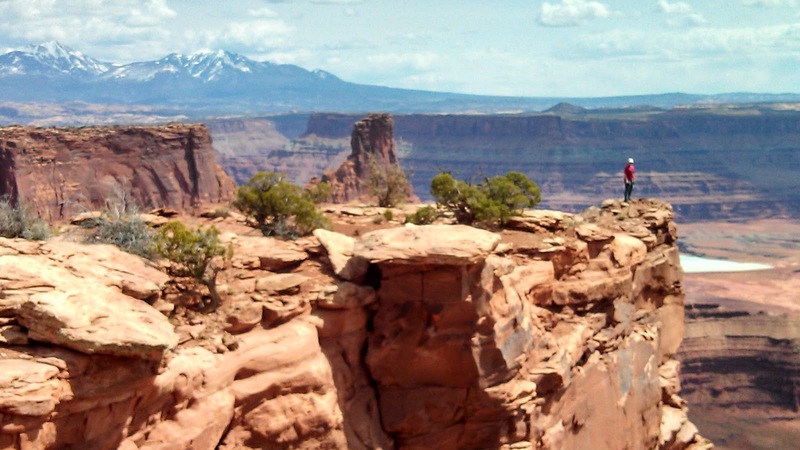 The point overlooks Canyonlands NP. You may recognize this area as it is one of the most photographed areas in Moab and rumor has it scenes from the movie Thelma and Louise were shot here. Sunday afternoon we met up with John and Pam of Oh, the Places They Go! 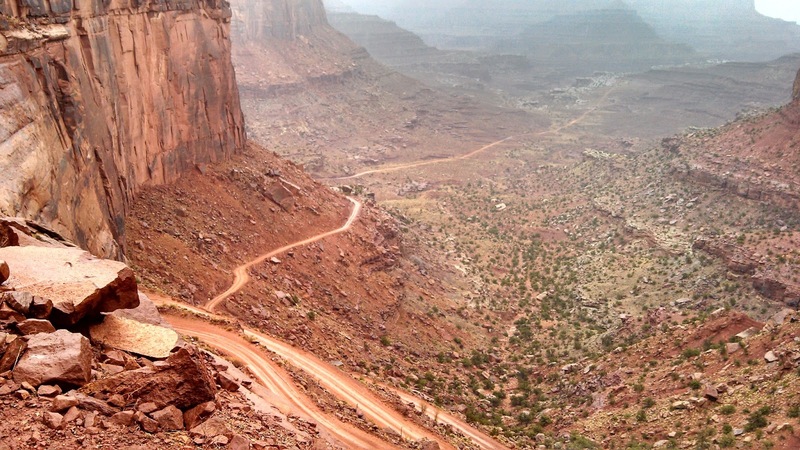 They have been in Moab for a few days already and have been out on some great hikes. We went out for supper and had a great evening spending a couple of hours just talking and getting to know them. Monday's weather forecast was for scattered showers so we decided not to hike, but to just drive around checking out the area. Next thing you know we're on Potash Road. We stopped at Poison Spider Trail pull off to see dinosaur tracks. We saw a couple higher up on the rocks so we climbed a little further and found several petroglyphs. Unfortunately too many previous visitors have defaced or destroyed several of the petroglyphs by adding their own graffiti. 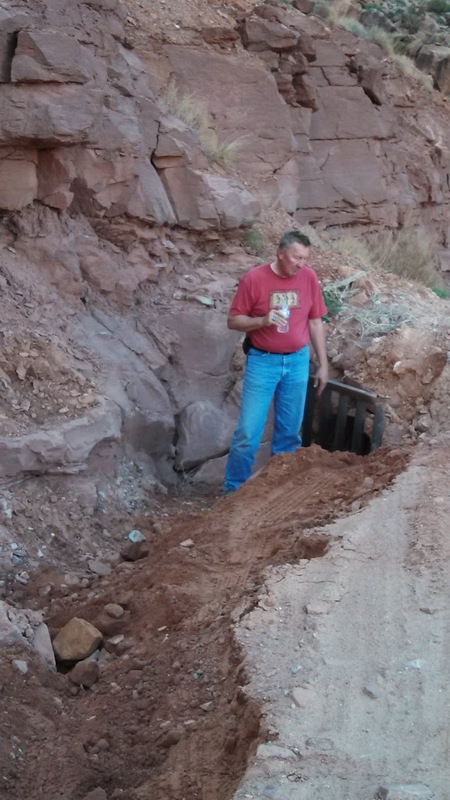 We returned to Potash Road and continued further out to discover a mining operation. 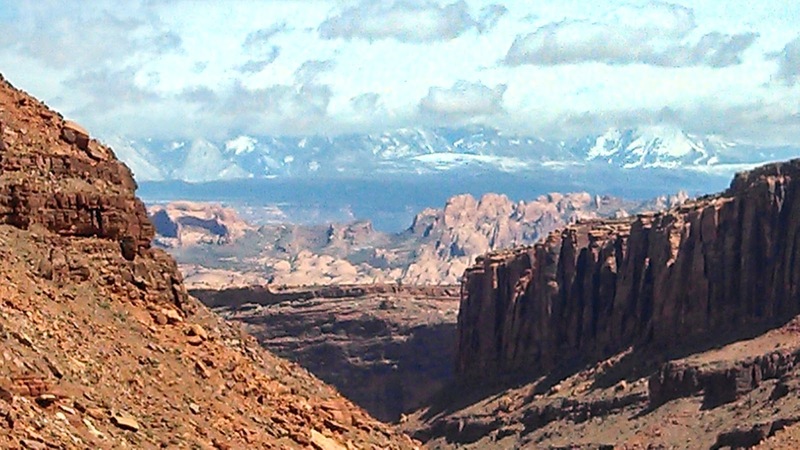 Between Moab and Dead Horse SP is a large underground deposit of potassium salt that is actively mined. Potash Road connects to Shafer Basin and crosses the mining property. We drove past the storage warehouse and the pavement ended. We drove another couple of miles and were stopped by one of the mine employees. They had been prepping an area for blasting and were just about to set off the dynamite. A few minutes later there was a big BOOM and a huge cloud of dust. We continued on and drove alongside several evaporation ponds. The salt is mined by pumping water into the underground salt deposit where the salt is absorbed into the water before being pumped to the evaporation ponds. Once the water evaporates large earthmovers are used to scrape up the salt. During our wait at the mining site we asked about the road we were on and discovered it travesed Shafer Basin and exited in Canyonland NP. That sounded like an adventure so we continued on. 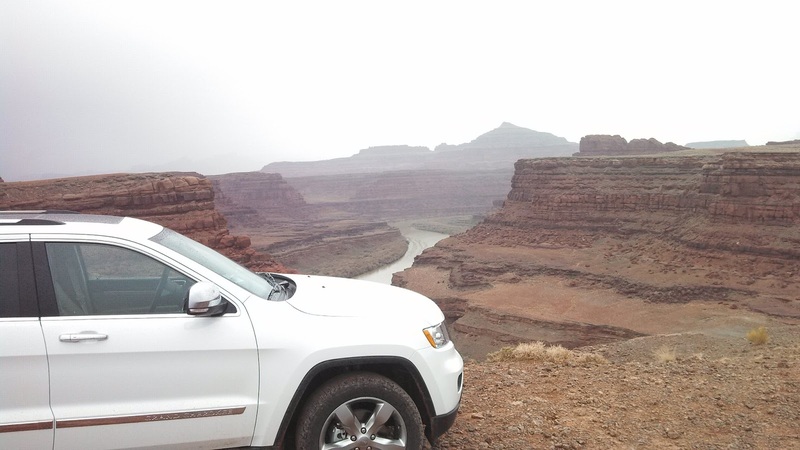 There were several locations where we were driving within 10'-15' of the cliffs overlooking the Colorado. 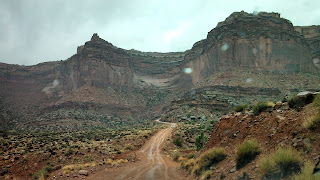 As we got closer to the basin wall the road became rockier and rockier and we noticed a series of switchbacks that appeared to climb a huge sheer wall out of the basin to the top of the mesa. 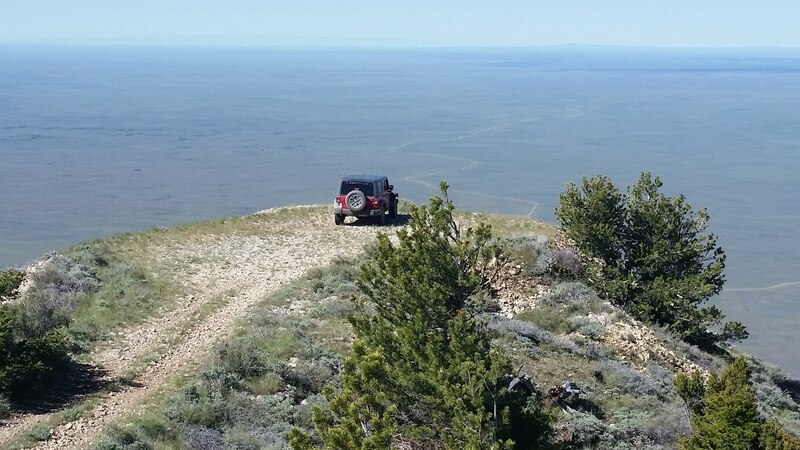 When we arrived at the switchbacks the adventure really began. It had been raining off and on, so we had been careful to watch for any signs of flowing water in the numerous washes we had crossed. 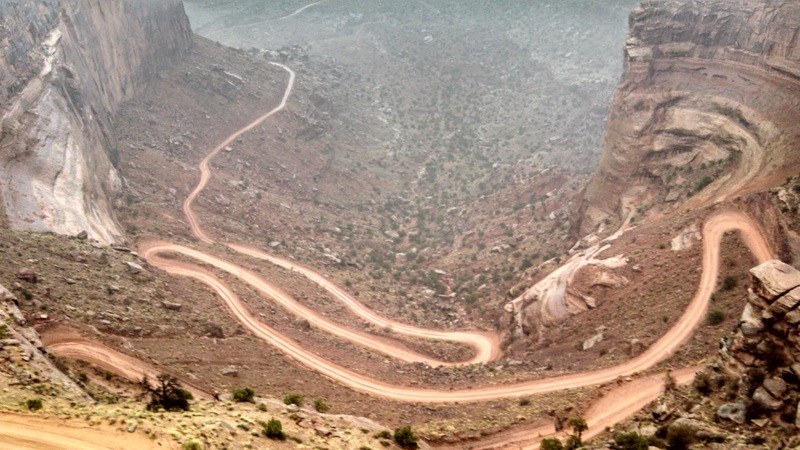 And because it was currently raining I was concerned about the road conditions on the switchbacks. The switchbacks climb over 1000' and were single lane. About halfway up we started to see fresh clay on the road (which was turning into mud in the rain) and the switchbacks turned into hairpin turns. I locked into 4-wheel low and tried to keep up our momentum without sliding on the slick clay. It was a little hairy but we made it without incident. Just as we got to the top we came across the road crew that had been spreading the clay. We stopped to ask a question and found out that once it started raining they had closed the road down the switchbacks because they knew it would become almost impassable. We had passed a couple of vehicles along our way and weren't sure that they would be getting out without turning around and driving the 32 miles back across the basin to Potash Road. The clouds closed in just as we exited the switchbacks onto the paved road so we called it a day and headed back towards Moab. All in all it was a great day and we enjoyed the adventure. We had planned to leave today, but the weather forecast is for snow along our route into Colorado for the next few days; so we think we'll stay here a little longer and wait for better road conditions before taking on the mountains. The last few weeks have been fun and busy. 1 of the 2 maintenance techs in Echo Bay is having knee replacement surgery and that only leaves our boss Tim to run things single handed for the next 4-5 months. On top of that Tim was scheduled for training for a week and he asked us to take on a few additional responsibilities and work weekends for a couple of weeks. We actually had a chance to go 'rock climbing' with Joan's cousin. No, we're not attaching our selves together with ropes and chalking our hands; rather we tightened our seat belts and held on for dear life as we tackled some 45-55 degree rock slopes in Brian and Theresa's modified jeep. As usual Joan would not open here eyes for the first few minutes, but she eventually woke up and had a great time. 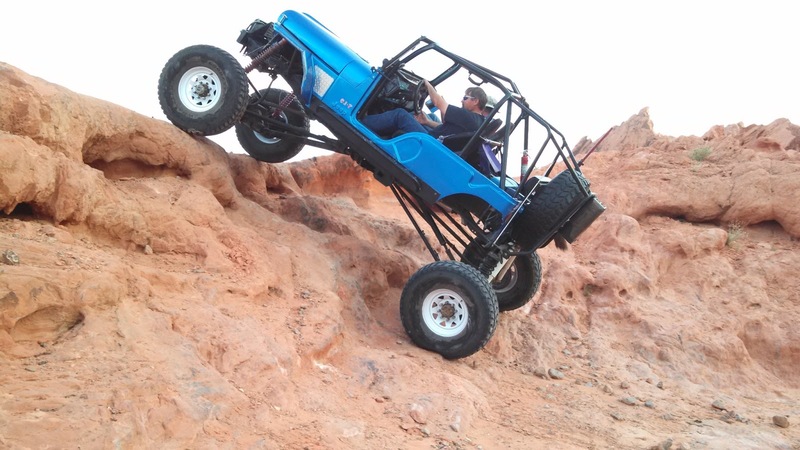 Brian modified the jeep himself and the ride we took proved what a good job he did. We took a couple trips into Mequite, AZ and took in a movie both times we were there. We both liked The Host and Joan managed to sit through Olympus Has Fallen which I really enjoyed (way too much shoot em' up for her). We witnessed the Air Force practicing pilot ejections over Lake Mead. We even spotted a very unusual plant and after a quick email discovered it was a Camissionia plant that has been infected with a virus. Sure looks cool though. We met some new friends, Joe and Gay from Good-Times-Rollin. 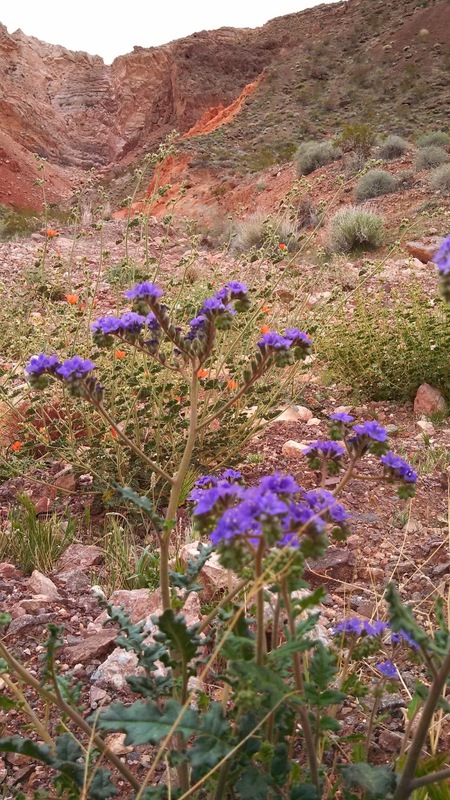 We spent a couple of days checking out Valley of Fire, Anniversary Narrows and the Botanical Cactus Garden at Ethel M Chocolate Factory. Yes I said Cactus Garden at the Chocolate Factory. If you're ever in Vegas, check it out. It's free and well worth the time. But I think someone once said "all good things must come to an end". Today was our last day at Echo Bay....really, no fooling. Easter Sunday was our last workday; today we spent the entire day preparing for the trip to Colorado. Joan worked on the inside and I worked on the outside. We started early and by mid-afternoon we were tired, sore and very happy with all we had accomplished. We have lots of stained glass lamps, bowls and sun-catchers that all had to be wrapped and insulated. Joan did her version of spring-cleaning while I washed the car, cleaned the front RV windows, made sure the bikes were strapped and secure and packed the basement with all our outdoor stuff. PS....checking our blog stats the other day we noticed that we just crossed the 20,000 'views' mark. Thanks everyone.